Flip will be performing with THE NEXT STEP on their Do it on the Dance Floor tour - playing the role of 'C-Major' - on Friday, 1st of Oct and Saturday, 2nd Oct. The Next Step features some of the best Tap, Hip-Hop and Break Dancers in Australia. The show is directed by Dein Perry (Director of Tapdogs), with Choreography by Jason & Kris Lewis. It features stars of So You Think You Can Dance, Tapdogs and an original soundtrack. The Next Step is celebrating the release of their second single and video ‘Do It On The Dance Floor’ by announcing a host of shows during the NSW school holidays. After an amazing debut release of ‘hurricane’ at Sydney Big Top Luna Park. The group will be taking their show LIVE to the suburbs with choreography of routines performed to favourite top 40 hits and original tunes. The group has performed everywhere from the MTV Awards, Splendour in the Grass, The Helpmann Awards and alongside Sir Elton John. 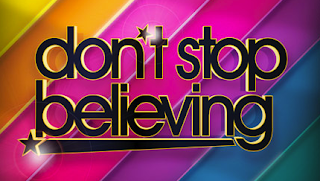 This week, I had the pleasure of performing with an exceptional bunch of people, launching Don't Stop Believing for Channel Ten. Such amazing and vast talent - I'm sure I'll be seeing many of them up in lights soon. We had some interesting times at the airport, and I even managed to fit in some twitter time with my friends at Virgin Blue, who ended up being very helpful. Submissions for the show are being accepted til the 29th of September. Get your Glee on and check it out.